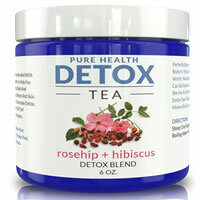 Pure Health Detox Tea is pretty good in my opinion, so I gave it 4 out of 5 stars. Where this tea really stands out is the taste. It tastes so good! Writing this is making me crave a cup of it. I don’t say that about most detox teas. I also like the ingredients in this loose leaf tea. It doesn’t have any harsh laxatives (Senna Leaf), so I didn’t have to deal with running to the bathroom often. It has one mild laxative (Dandelion Leaf), but it didn’t have any laxative effects on me. My body felt as regulated as it normally does. I really like this tea, but I don’t think it provides a great “detox” if you just use it alone. This company encourages you to eat healthy, workout, drink this tea among a few other things. 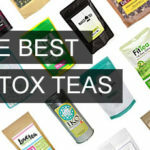 I can really stand behind that, as I think detoxing and weight loss can’t solely come from a tea. But overall, this tea is pretty good so I gave it 4 out of 5 stars. Pure Health Detox Tea is pretty easy to use, although they’re a bit vague on how it’s supposed to be used. 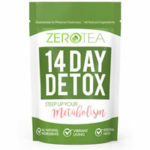 The directions say you can enjoy it as an everyday detox or drink it as part of Chef Jeff’s 7 day detox program. So I’m guessing if I’m not doing the 7 day detox program, I just drink one cup a day? It’s a loose leaf tea, so make sure you have an infuser on hand. This tea is natural caffeine free, so you can drink it at any point throughout your day. I’d drink mine mid morning. You just put one teaspoon of tea in 8 oz of boiling water for 5 minutes. Easy enough. One thing that’s different about this tea is it comes in a jar as opposed to a bag. I tried this is the Rosehip and Hibiscus flavor and I really enjoy the taste of this tea. It’s tangy and a little sweet. Hibiscus is the flavor that really comes through, and I love hibiscus. I could easily drink a few cups of this tea a day, it tastes THAT good. I didn’t need to add any lemon or honey to alter the flavor either. This tea comes in 3 different flavors… Rosehip and Hibiscus, Peppermint Berry, and Rooibos Lemongrass. This detox tea has pretty good ingredients. It doesn’t have any strong laxatives in it, but it has one mild one… Dandelion Leaf. I don’t mind Dandelion Leaf like I do Senna Leaf, because it doesn’t have such a harsh effect on my body. Dandelion Leaf is actually a good ingredient that has a lot of benefits, such as protecting your bones and improving digestion. This detox tea also contains Rosehips, which are known to be very high in Vitamin C. As we all know, Vitamin C is great for your immune system and preventing colds and the flu. The next ingredient in here is Hibiscus. Hibiscus is said to help treat high blood pressure and high cholesterol, which is amazing. This ingredient also gives the tea a pink color. Pure Health Detox Tea also contains Orange Peel, Cinnamon, Ginger and Stevia. Not only do these ingredients give the tea a yummy taste, but they also have health benefits as well. To be honest, I didn’t feel that different while using this tea. But I felt good, like I normally do. A lot of the detox teas out there make me feel like crap. They mess with my digestive system and energy levels. This one didn’t do either of there. Now, this is no miracle weight loss tea. But I like how Chef Jeff (the man who sells this tea) encourages an overall healthy lifestyle in order to detox. He encourages healthy eating, working out, and even detox baths! That’s my kind of detox. I didn’t notice any weight loss results, but I felt good, and that’s just as important. One thing I noticed was that although this tea is caffeine free, I still had a lot of energy. That’s a bonus! I didn’t have any stomach cramps or gross digestive issues like I do with some detox teas. Overall, I like this tea, but don’t know how much of a “detox” the tea alone provides. I didn’t have any negative side effects while using this detox tea. 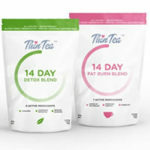 Pure Health Detox Tea sells for $29.95 for a 36 day supply. That’s a reasonable price. They claim to have a guarantee on their website, however, I couldn’t find it anywhere. To buy Pure Health Detox Tea, Click Here. Results I didn’t see any noticeable results, but I felt good. Price/Value It’s $0.83 per day, which is pretty cheap. Guarantee Yes, but I couldn’t find it?